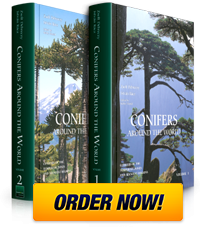 This book is an absolutely „must have”, now and on, for everyone really interested in conifers. What make this publication unique, are the overwhelming illustrations – 3700 conclusive and high quality color images taken in the native habitats of the conifer species, as well as the abundance of other graphics. Each species is represented by a large photo of the habit and 3 to 5 smaller detail images of cone and foliage; also, there is an extensive bark gallery. The photos are a valuable documentation as they show conifers in their natural habitats. This information cannot be overestimated in our era of tremendous losses in natural habitats and biodiversity. This work is not merely a conifer classification book, but is more than that: not only the genera and species are thoroughly described, but also the regions in which they thrive. When relevant, focus is placed on related species and regions where the species exhibits a wide scale of variation, for example in the case in various pine species in Mexico. The series of cone variability photos in their entire range are a very good idea to explain the „species amplitude” and their apparent transitions. Such examples are usually lacking in other works, but are present in this book, making a useful contribution to those who find themselves in identification problems. This book is an absolutely „must have”.